Mexico’s Riviera Maya is the family-friendly destination that needs to be on your bucket list, especially with excursions that combine nature, culture and adventure. I recently visited the region and instantly fell in love. There’s so much to experience in this part of Mexico, I cannot wait to be back. Located on the eastern part of the Yucatán Peninsula, just south of Cancun, Riviera Maya stretches 100 miles along the Mexican Caribbean. It’s known for its beautiful white-sand beaches, Mayan ruins, and so much more! It’s also home to the world’s second largest coral reef, the Belize Barrier Reef. If you’re coming from the Los Angeles area, Riviera Maya is about a 4 -hour flight. Yup, you read that right. Paradise is just four hours away. Which is a bonus when traveling with kids. 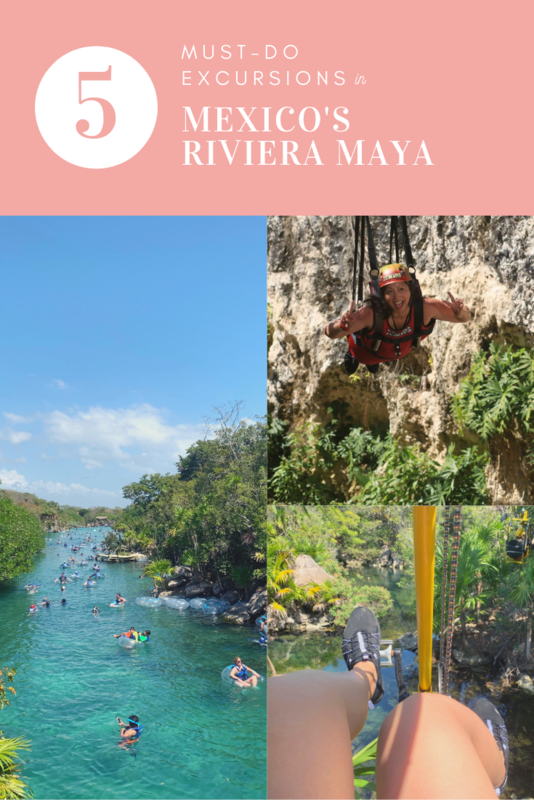 Whether you just want to float in a cenote (a natural sinkhole) surrounded by crystal-clear water or be adventurous and zip-line above a jungle, there’s something for everyone in Riviera Maya. During my trip, I experienced five different eco-touristic excursions in four days…and its become my favorite way to travel. Ecotourism is traveling to connect and experience nature with a mission to learn about and, ultimately, help protect those environments. 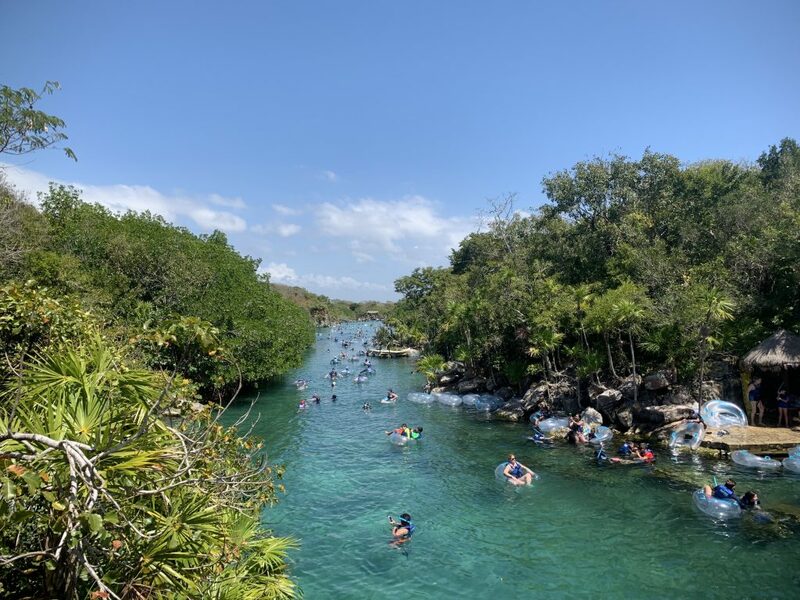 In Riviera Maya, the Xcaret group offers those experiences in their parks by surrounding travelers with the natural, cultural, and archaeological richness of Mexico. Their parks include: Xcaret, Xel-Ha, Xplor, Xplor Fuego, Xenses, and coming soon, Xavage. These parks are filled with adventure…and water! So be sure to pack-up multiple swimsuits, your own towel (I borrowed from my hotel), a rash guard, waterproof phone case (with an attachment to wear around your neck), and most importantly water shoes with a good rubber sole. Use biodegradable sunscreen and insect repellant containing only titanium oxide and zinc oxide…its to protect the waters from harsh chemicals. 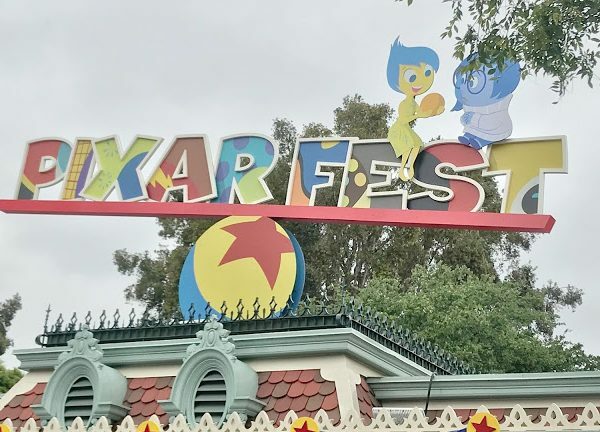 If you can’t find them, don’t worry, you can purchase at the parks. Day one of my trip got my adrenaline pumping! Xplor Fuego is the nighttime adventure park where I conquered my fears on the zip-line. I’ve never done it before and experiencing it in the dark was so much fun…I probably woke-up the monkeys with all my screaming. Sorry. 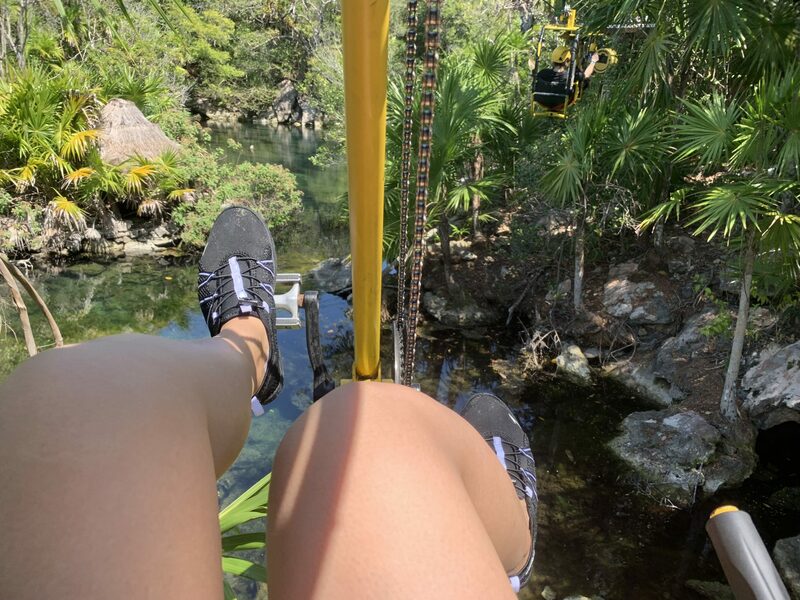 It was such an incredible experience to see the silhouette of the jungle from the tallest zip-line course in Cancun and Riviera Maya…and you will get wet! Xplor Fuego is an all-inclusive park with a buffet restaurant and non-alcoholic beverages, so take your time to enjoy a break from all the fun. The nighttime adventure also includes a drive through the jungle in an Amphibious Vehicle – be sure to smile, there’s cameras along the route to capture the moment, there’s also Underground Rivers to explore the stalactites, stalagmites, caverns and caves, and don’t forget to fly over a cenote while sitting in a hammock! In the Mayan language, Xel-Há means “where the water is born.” During pre-Hispanic times the area served as an inner port and trading center…now its become a Natural Wonder in Mexico with flora and fauna species making it their home. 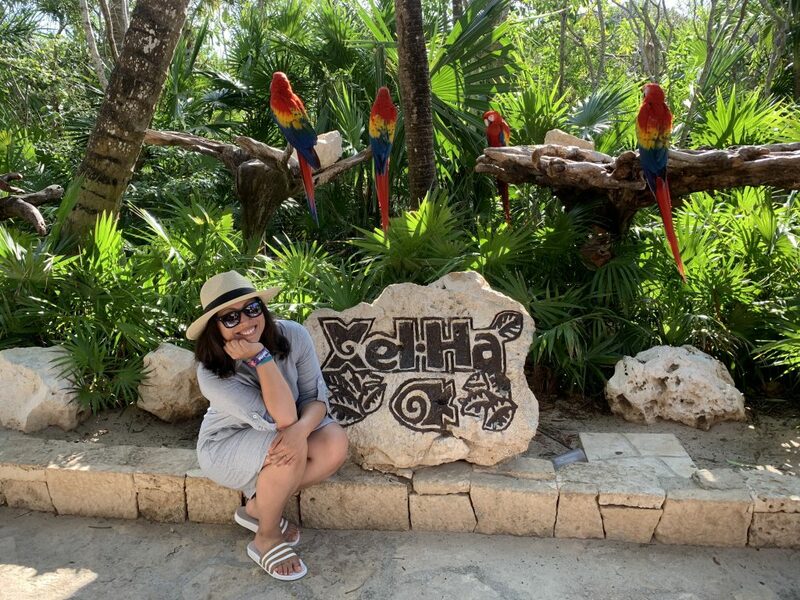 Xel-Ha is an all-inclusive park that’s perfect for all ages. It’s simply paradise. 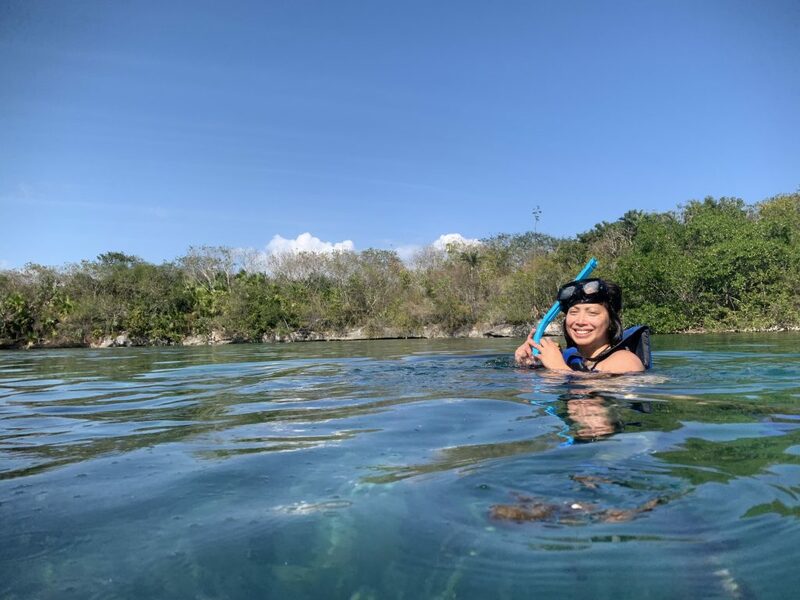 There’s jungle trails, cenotes to view from above on a Zip-Bike, a historic Mayan wall, and countless of other activities, including snorkeling. It a great way to spend the day. And since its all-inclusive, you don’t need to worry about packing snacks and food because its all included with your admission…even the snorkeling gear and lifejackets are included. There are additional fees for the optional activities like the Zip-Bike, Manatee Encounter, Scuba, and others. 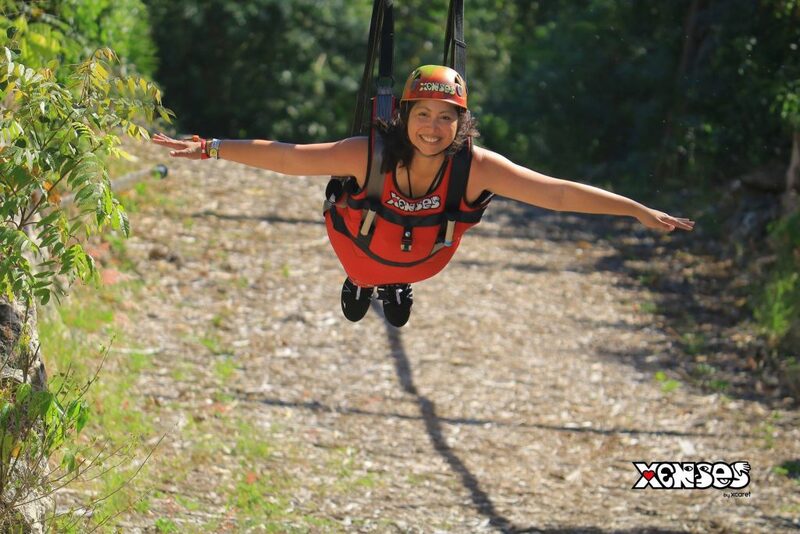 Xplor during the day is a different experience compared to Xplor Fuego. 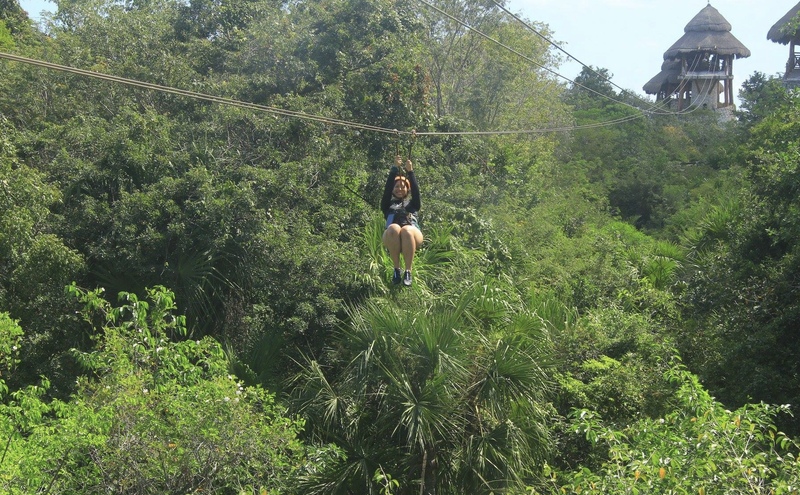 Being able to see the jungle that surrounds the park while zip-lining was a whole new thrill ride. You’re taken on a different and wetter route on the Amphibious Vehicle trek and there’s a different energy that you experience during the day while exploring the caverns. Xcaret is the park that started it all. There’s water activities, like the underground rivers to swim in, but this park is special because it brings the Mayan culture alive. 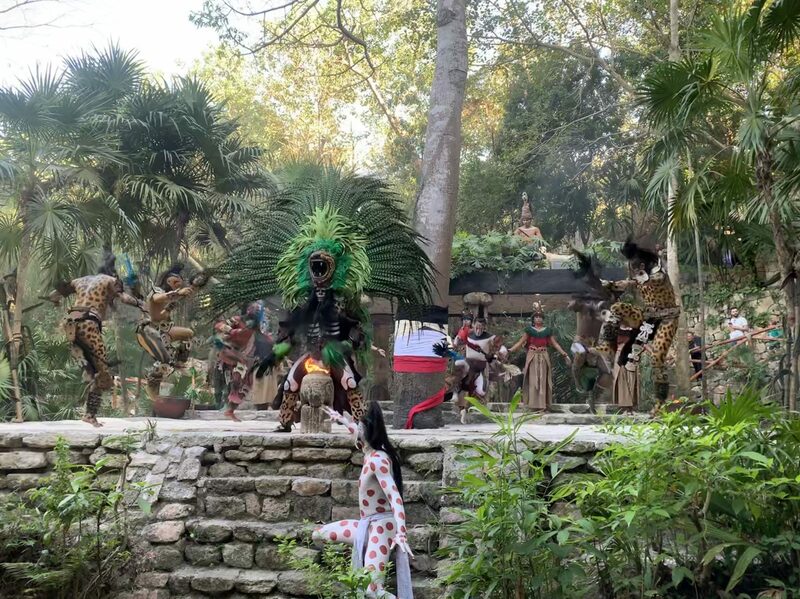 During sundown, you can experience the pre-Hispanic dances with Mayan performers dancing surrounded by the underground river and jungle. There’s also a Mexican rodeo that happens in a different area of the park, so you’ll want to hurry to get there once the Mayan dance is over. Comfortable shoes are must when visiting…the park is huge. The show was so impressive and amazing to watch as the horses share their tricks! 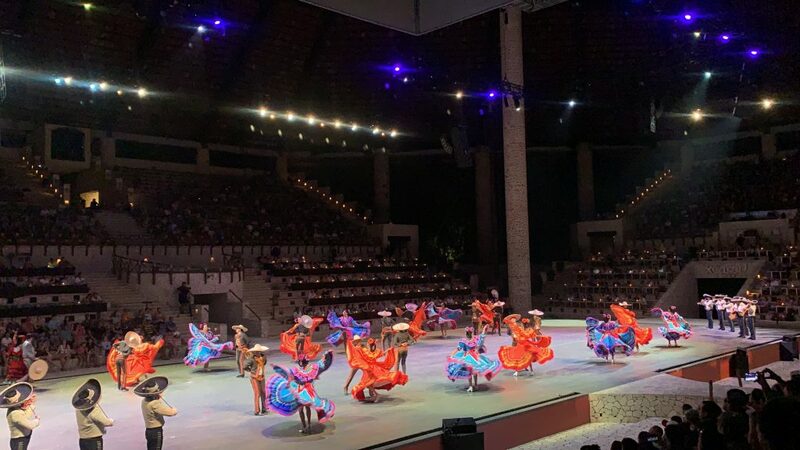 Xcaret Mexico Espectacular is a must-see show dedicated to Mexico. 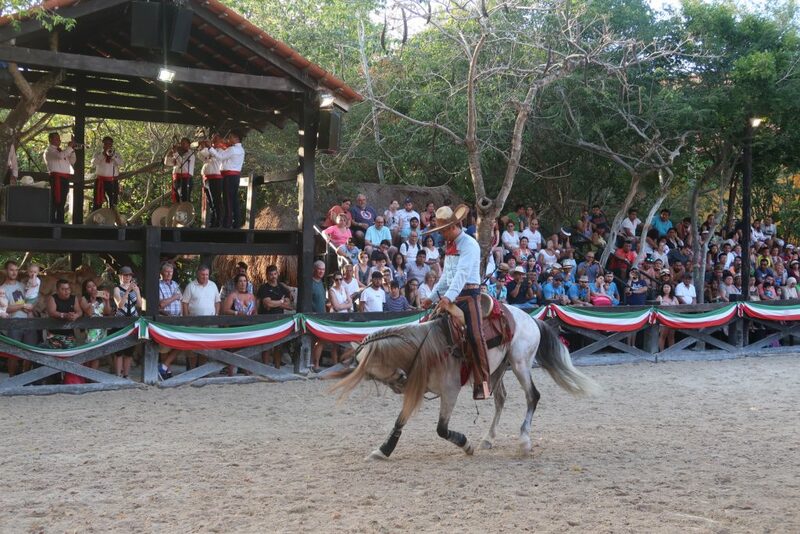 It’s a two-hour journey through the country’s history with live music and dances, showcasing the different cultural regions of Mexico. It was a fun, colorful and energetic show…AND the best way to spend my last night in Riviera Maya. Xenses is a half-day park that I got to experience before my flight home. It’s a place where your imagination will take over. There’s two circuits of activities that’ll test your senses! It was the perfect park to end with and it was a life changing experience for me. 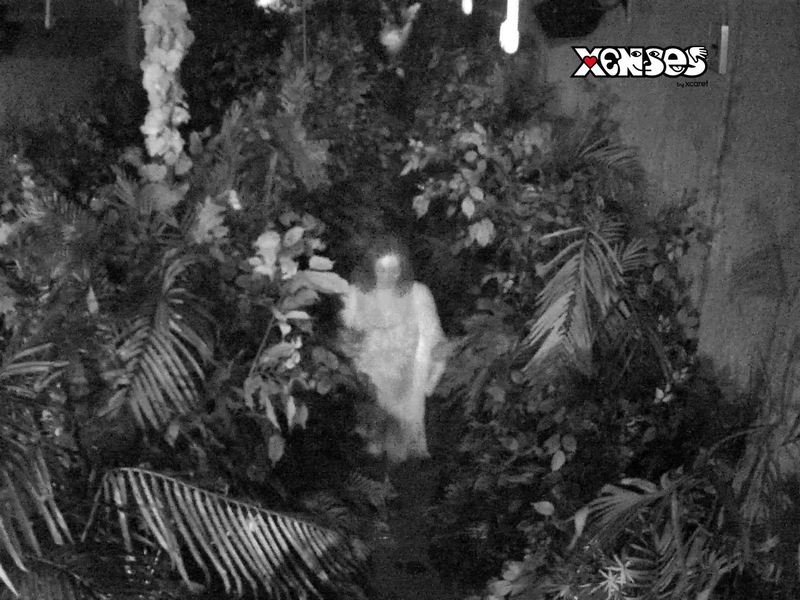 Xensatorium is an attraction that you experience alone – in total darkness. You walk through different ecosystems (in complete darkness) and learn to trust your senses to tell you where you are. So, I’m scared of dark, confined spaces and being alone in that cave was nerve wrecking. Nothing you hear inside is real BUT it sure felt that way. It was a crazy experience for me and yes, I got very emotional when it was over. The experience made me trust in myself – that I can do anything. Try it yourself, if you can. I promise its safe. Other fun attractions include a Bird Flight, Riverlaxing (floating on a salt river), Sludgerie (a mud river to cleanse the body and mind), and more! 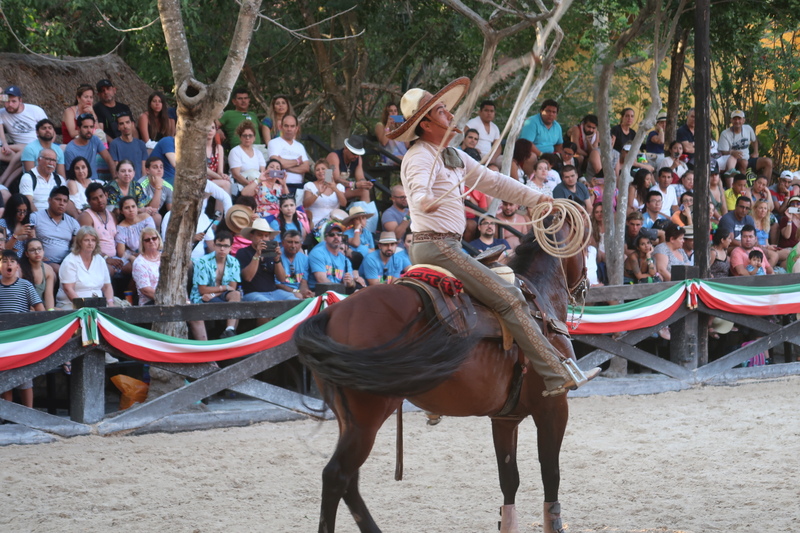 Be sure to visit Xcaret Parks for more info. 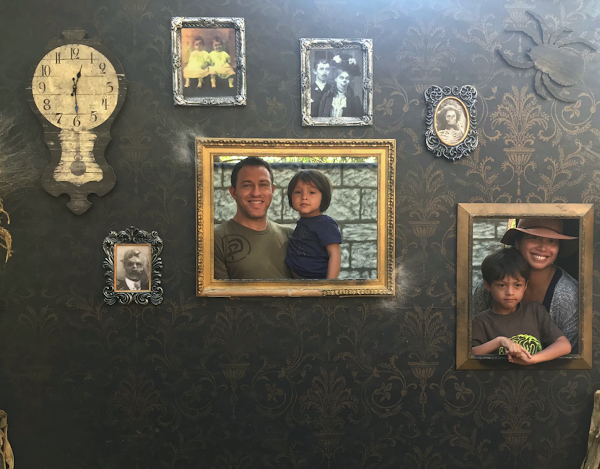 What do you look for when planning your family travel? 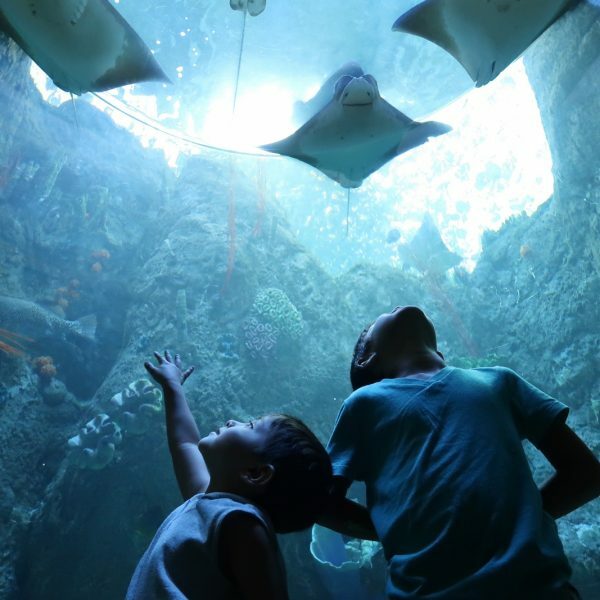 See more Things To Do in Cancun with Kids from Family Vacation Hub! 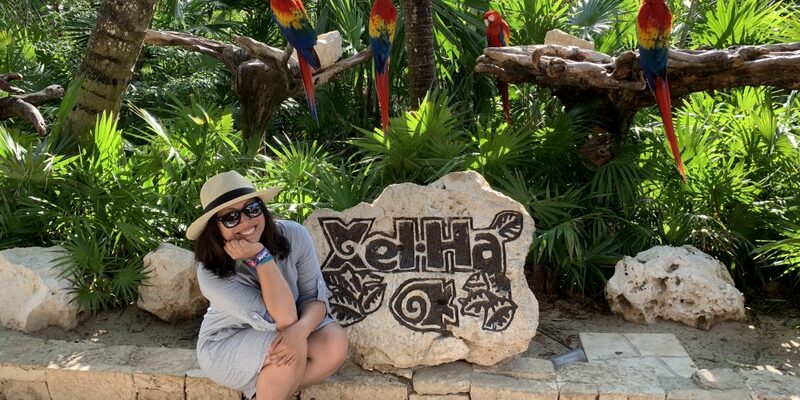 Thank you ConnectHer Media and Xcaret for this incredible opportunity. All opinions are my own.